A few weeks ago I made pumpkin butter, a lot of it. Who know how much two little baking pumpkins would produce! Now I'm looking for ways to use up this pumpkin butter - not that we aren't enjoying it just as it is on simple toast and biscuits, but there is something to be said for diversity. Plus, I haven't been making any treats for Dave lately so this was the perfect opportunity to transform pumpkin love. 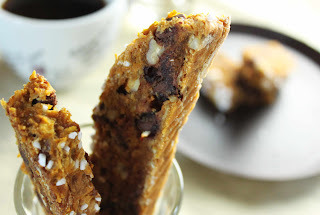 There are thousands of biscotti recipes out there and everyone has their own preference whether it's hard and crunchy or softer and chewier - my preference is for the way biscotti was originally created. It should be a hard substance meant to withstand long travels and for dunkin'. So what makes mine better than the others? I like it. You make yours' your way and I'll make mine my way. One big difference can be the use of actual butter; the butter will make a softer biscotti as well as less cooking time and the cookie will not last as long. I'm not saying this is the end-all-be all biscotti recipe. I think each flavor requires tweaking; what works for this pumpkin butter biscotti may not work for an anise biscotti. I also think you could substitute apple butter for the pumpkin, or use a pumpkin puree. Taste the dough though, to see if it needs extra spices- I made my pumpkin butter quite heavy on the ginger for that extra kick! Oh, and I used pearl sugar on top (a strange ingredient sent to be by loyal readers!) as a tasty and decorative topping. One of the other reasons I made up this recipe is for Dave to have an optional quick breakfast bar in the morning. To keep it on the healthy side, I used oats, whole wheat flour and pecans. Since there is no butter in this recipe- it's not a bad option. Sure there is sugar, but call it a trade off! How often can you use one food item as a breakfast item, a bread or side dish, an appetizer or a dessert? It's a rare fat and happy transformer treat! Tips and Techniques: Store in the freezer for a fast snack, side or dessert anytime! The biscotti are easier to handle if you make two small loafs out of the dough rather than one. Sift all the dry ingredients into a big bowl. Mix together the egg, vanilla, pumpkin butter and soy cream, stir into the dry ingredients to combine. Add the pecans and chocolate. The dough will be really sticky. Sprinkle 1/4 cup flour on the counter. Lightly roll/knead the dough into the flour. Let me repeat, the dough is super, super sticky- do the best you can, just to incorporate the flour. Cover a baking sheet pan with parchment paper. Divide the dough in half and form 2 logs on the pan. Sprinkle with pearl or raw sugar, more nuts or even more chocolate. Bake at 350 degrees for 30 minutes, or until the biscotti is firm in the middle. Remove from oven, let rest for 15 minutes. Turn the oven down to 225. Slice the biscotti, lay each piece back on the parchment lined pan. Return to the oven for about 1 hour. Test the cookies, you might want to take them out early for slightly chewy cookies or leave them in longer for the extra crunchy cookies.